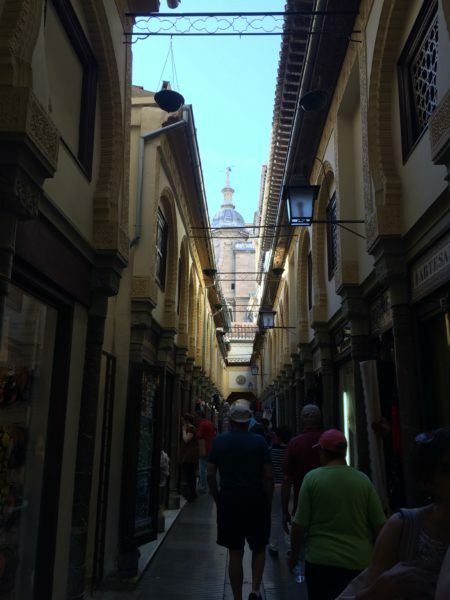 This is the third year in a row in which my husband and I have taken a trip overseas, this time to Spain and Portugal with a day-trip to Morocco thrown in. 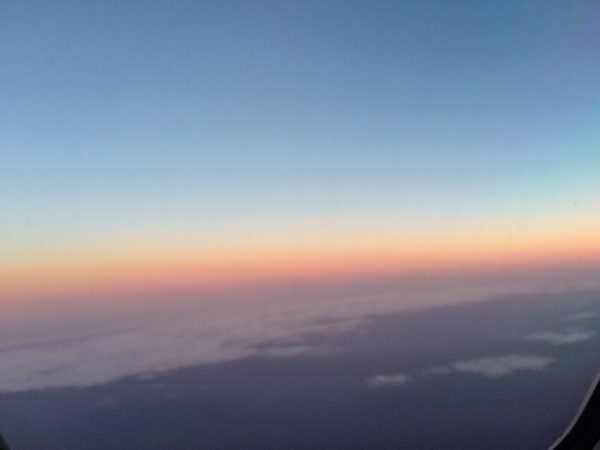 The flight from Boston to London Heathrow begins with a cool photo from the plane. I’m going to share some of the fun things that happened as well as the problems. We arrived in Madrid the next morning, or at least it was morning in Spain. At home it was the middle of the night. I got about three hours of sleep on the plane, so staying awake for the next twelve hours was a challenge. 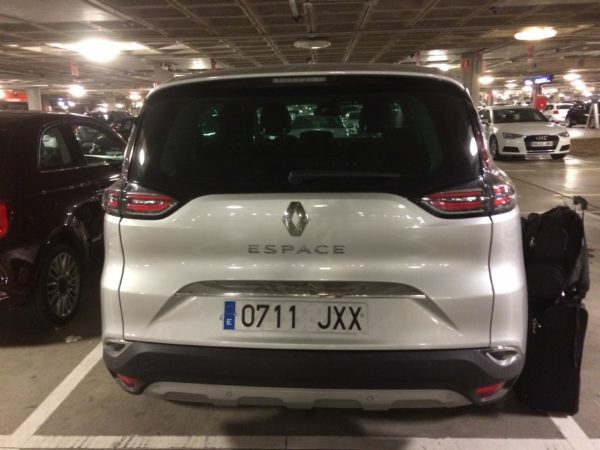 The first thing we encountered on our trip out of Madrid on our way to Barcelona was a rental car with instructions in Spanish and French. It did have a GPS guidance system, but it took us a third of the trip to figure out how to get the instructions in English. A lovely British lady led us through Spain and Portugal. “Enter the round about and take the third exit.” I can still hear that voice. Driving and parking on narrow streets was definitely a challenge. How would you like to drive this car down a street like this? Food was sometimes a challenge. We had wonderful tapas in Spain, but I also had calamari that was so tough I couldn’t bite through it. Thankfully, the waiter took that off our bill. 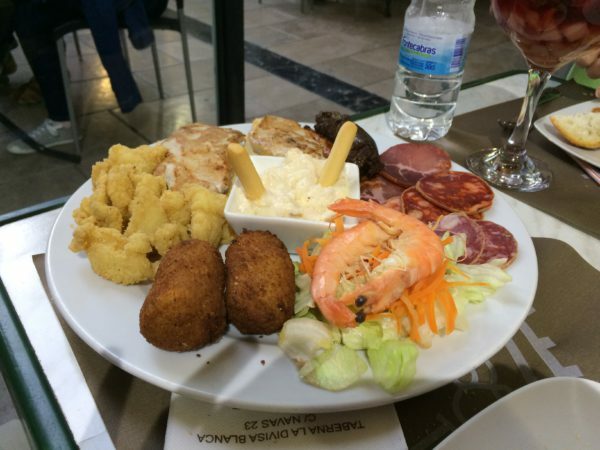 Below is a sample of a tapas plate we enjoyed, especially the croquets. One particular day when we were traveling between cities, we stopped in a small town to get lunch and have a bathroom break. Little did we know that no restaurants were open because it was Monday. There were little bars open, but they didn’t have food other than olives and some other things we really didn’t want to eat. Thankfully, they let us use the bathroom, which was also sometimes a little humorous. They are very conscious in the EU about conservation, so lights only come on in the bathroom when you enter, and sometimes they go off before you are done. It is pitch dark, and you can’t see a thing. One time I was waving my hand in the air every thirty seconds in order to keep the light on. Soap, toilet paper and a hand dryer that actually dried your hands were often in short supply in public restrooms. We finally wound up eating our lunch in the parking garage where we had parked our car before walking into the center of town. We bought a loaf of bread and a few apricots to add to the cheese and olives we had in the car. 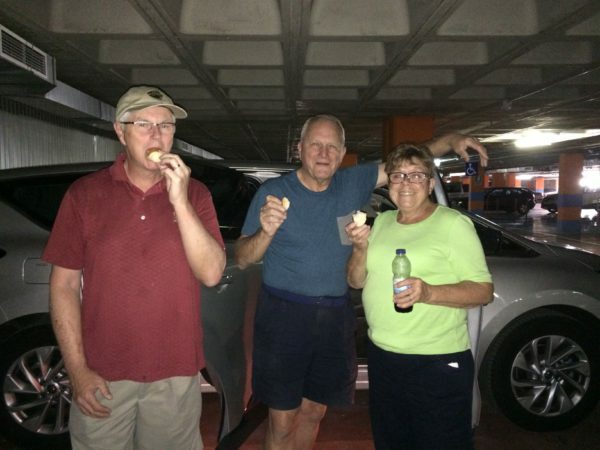 Here we are enjoying our meal in the parking garage. Dining at its finest! When we were in the big cities, we used public transportation, especially the subway system. That worked pretty well most of the time. We had one lapse when we went into the subway station the wrong way, and there was no way to get to the other side of the tracks except to go out and buy another ticket. In Lisbon, we bought a Lisboa card and used it on the train, subway, and buses. It was great until the last day our friend’s card quit working, and we had to double up to get him through the gates until we were able to get to a tourist information station to get him a card that worked. We walked a lot, laughed a lot, and climbed a lot of stairs. 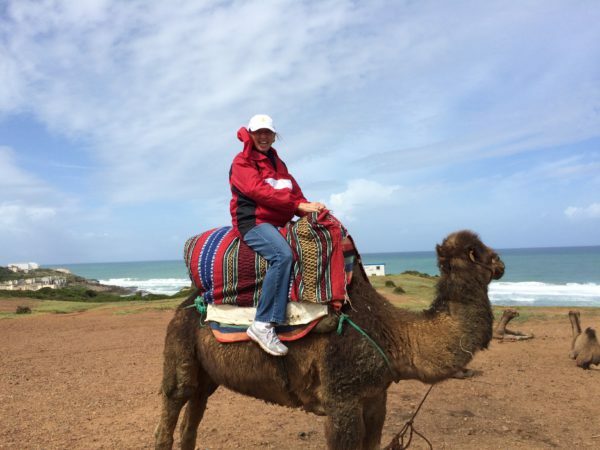 I got to ride a camel in Morocco. His name is Mustafa. It was rather a bumpy ride. I can’t imagine riding one for very long. We stayed in two places with incredible views. The first photo is a picture I took from the patio of the place where we stayed in Tarifa, Spain. 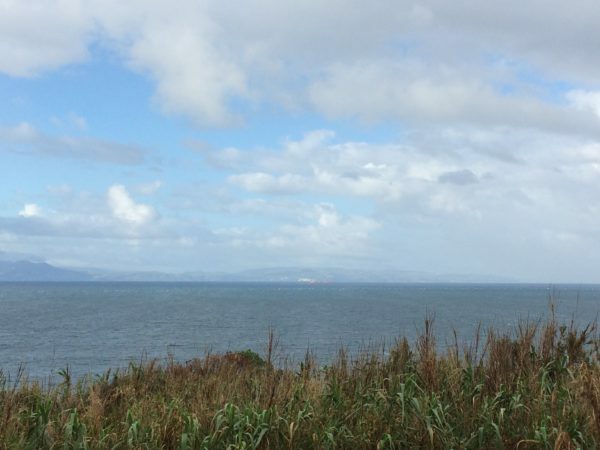 You are looking across the Strait of Gibraltar to Morocco. 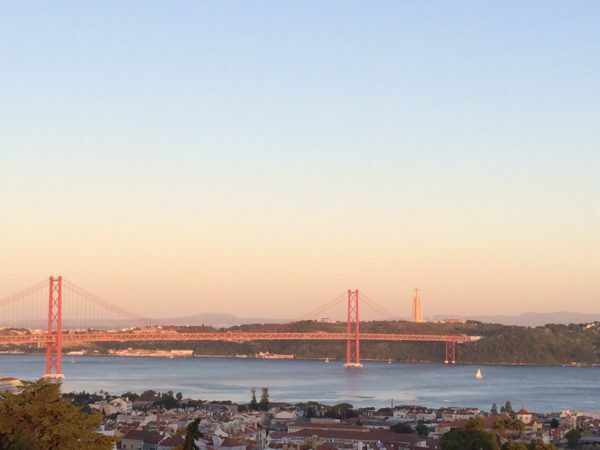 The second photo was taken from the balcony of the place we stayed in Belem, Portugal, a suburb of Lisbon. I have a lot of other photos and experiences to share. Please visit my Facebook page where I am sharing more photos in the coming days. What travel challenges have you faced? 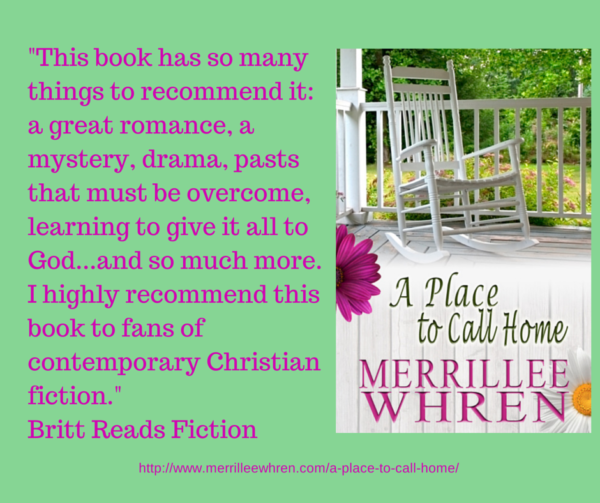 I’m giving away an e-book copy of the first book in my Front Porch Promises series, A PLACE TO CALL HOME, to one person who leaves a comment. I will draw the winner’s name on May 30, 2017 at 9PM MST. Biggest travel challenge: definitely when in Thailand!! I am so thankful I was there with my cousin who lived there for a couple years, teaching. Wemble, Thailand must be an interesting place. My daughter has been to Bangkok several times on business. Thank you for sharing your story and the beautiful pictures! Iraines, you’re welcome. Be sure to check out more photos on my Facebook page. I really enjoyed your post. That road looks more like a sidewalk! I can’t think of any travel challenges off the top of my head that I experienced as an adult, but when I was a kid our pickup broke down on the Freeway in CA. not far from LAX. I was coming down with chicken pox and I miserable. I’m pretty sure we sat on the side of the freeway for the better part of the day until my dad’s brother could come and help us. I have lots of car breaking down stories from my childhood. Kimberly, I can understand why you didn’t like traveling by car. I really didn’t either as a kid because I always got car sick. Thankfully, I outgrew that malady. The street I showed is little more than a walkway. We had to pull in the mirrors in order to get down some of the streets. One required a turn that we just couldn’t make, and we had to back up until we found a place to turn around. I always enjoy your travel post, Merrillee and this one didn’t disappoint. Thank you for sharing your amazing photos. The one with you on the camel is simply priceless. Have a wonderful and safe Memorial Day Weekend. Thanks, Jill. You have a good one, too. Hi Merrillee! Love the pictures. Even though I have visited 6 European countries, I never personally drove in any of them. Challenges faced: racing through the Amsterdam airport to make my connection to Berlin and sliding in my seat as they closed the plane door. Getting yelled at for walking on the bike lane in Berlin. My main challenge was in Japan to remember they drive on the left side of the road, always wanted to get in the driver’s seat! Also in Japan, one does not hand clerks money, one places the money in a tray by the register. Different countries, different customs! Enjoyed reading your Front Porch Promises series. Renate, I had the same experience in Berlin with the bike lane. It’s hard to remember not to walk there. The bicycle riders in Amsterdam do not yield to pedestrians. Yes, it is interesting to learn local customs. Thanks for sharing. We are blessed to have German friends, so when we went to visit them they took us to Switzerland, Austria, Southern Germany and Lake Como Italy. Since they are seasoned travelers we didn’t have any issues. Gina, those are lovely places to visit. Our first European trip many, many years ago included Switzerland. It is still one of my favorites. Enjoyed your post and the pictures! I’m a picky eater so I’m not sure about the food…. My husband, daughter and SIL took a cruise for our 30th and 5th wedding anniversaries. I had a hard time walking and struggled everywhere we went. When we got home I found out I had a torn cartilage in my right knee and had to have surgery! Gail, that’s rough walking with torn cartilage in your knee. My friends discovered that I’m a rather picky eater, too. Hubby and friends all like fish, and I’m not much of a fan, but I did eat some good salmon, one of the few fish I like. When I was in College, I went to Malawi to work with missionaries for the summer. Our plane was late arriving, and when I got to the area where someone was supposed to get me, there was no one to pick me up. I had no phone number or address for them, I only knew their names. A taxi driver told me he would drive me to where I was going, but I didn’t want admit that I didn’t know where that was. I prayed like crazy and around 20 minutes later the person there to pick me up showed up. What a relief! They were in the airport all along but since the plane was late, had gone to a window to soak up some sunshine as it was winter there. I just remember that feeling of panic thinking that I was in a country in Africa, and didn’t know where to go, or what to do if no one came. Tammy, that must have been scary. On the day we arrived in Madrid, my husband and my friend’s husband were supposed to take the car to a nearby parking garage. So we were supposed to meet them in a few minutes at the restaurant in the main floor of the apartment building where we were staying. We went down and waited and waited and waited. We couldn’t understand why they were taking so long when the parking garage was only a block away. This garage was in a Marriott hotel, and for some reason no one seemed to know where it was, and they didn’t see the signs that we saw sitting at the restaurant. They finally found a parking garage miles away and took a cab back. We were so worried that they might have had an accident. Many years ago my family went to Europe and frequently we forgot where we had parked! One of my brothers was like a human GPS because he always knew where the car was! Martha, parking there can definitely be a challenge. We had a parking space that went with one of the apartments where we stayed, but we had to back into the garage. It took nearly 20 minutes to maneuver the car so hubby could back down the ramp. Lovely views! I’ve never travelled out of the states. I thought the streets in San Francisco were narrow when we visited there, but compared to Europe, maybe not. It must be interesting to have the lights go out while in the restroom. I guess having a small flashlight in your purse would be a good investment! Sherri, yes the street in many European town were built before there were cars. I’m amazed that people drive on them. I talked to someone after we got back who suggested having the small flash light. I guess I could’ve used the one on my phone, but I didn’t think about it. Speaking of light going off, had the opposite experience in Bern, Switzerland. We arrived around dusk and went to my room using my key card to get in. Turned on the light switch and nothing happened. Tried the bathroom – no lights. Went to the front desk and stated the problem, was told to use my key card. Totally confused went back to my room. Switzerland is very energy conscious with electricity and water. On the wall was a place to insert the key card and then there was power in the room for lights,TV, and min frog. Nice the lights were on I. Puls read the sign. A flahlight would have been helpful. I felt so foolish, it it is a great energy saving concept! Renate, most European hotels do that with the key card. It is a good idea to keep people from leaving the room with all the lights on. I spent a few months in Bolivia many years ago, visiting my sis and her family who were missionaries there. I remember thinking everyone drove with a foot on the accelerator and a hand on the horn. Slowing down was for sissies! The food was amazing, but we had to drink soda for nearly every meal since the water was undrinkable. This was before bottled water was prevalent. I’m sure I drank more coke those three months than the rest of my life put together. Valerie, I was amazed at how fast the cars went down those narrow streets, but they are very good about stopping for pedestrians who are in the crosswalks. I really hate paying for bottle water in restaurants. We had no issues with drinking water on our trip. The photo with the food has a bottle of water in the picture. We went to the grocery store and bought packs of water, so we would have water to carry with us each morning when we started out. That saved us a little money not having to by water somewhere along the way. Your trip sounds amazing. I enjoyed seeing the pictures and reading about your journey. Thank you so much for sharing with us! I am glad you had a nice trip and are home safely. Hi Marrillee, it’s so nice to hear about your trip to the iberian peninsula. I’m from Brazil and we were colonized by the Portuguese, so many of our old streets/towns look exactly like your narrow street. I’m sorry it took you so long to get GPS in English and I hope that didn’t include getting lost. One of the biggest challenges we had when traveling was communicating somewhat. We lived in upstate NY and travelled to Canada many times, often ending up in Québec, which for us meant we have found many people who refused to speak (maybe even learn) English. It was winter and we did manage to order hot chocolate and pastries in French in a small town where none of the staff spoke a word in English. Being from a Latin country did help getting some of the words from the menu, but still, we had some trouble with street signs and detours coming back home. In this trip, the exit was closed when we were coming back and the instructions were all in French for what to do if you want to take another road… our phones’ GPS didn’t work in Canada, which made it a little trickier, but we kind of new the general direction we were going which eventually meant we found a different road, and managed to reach the border. The level of anxiety was high– to say the least. Priscila, we found that more Portuguese people spoke English than Spanish people. I had Spanish in high school many, many years ago. I began to remember more phrases and words the longer we were there. Even though the GPS wasn’t in English, at least the map helped guide us, but it was sure better after we got the English directions! Hi Merrillee! I posted but think it went to the ozone! Anyway, I’d love to win your new book and/or an Amazon gift card! And thank you for sharing your trip and photos – spectacular! Ruth, thanks. I’m glad you found your way here.